The 100k gift to Howard University helps 34 graduating seniors have a $0 balance to ensure they graduate in May 2019. Alexandria, VA (February 4, 2019) — Rev. 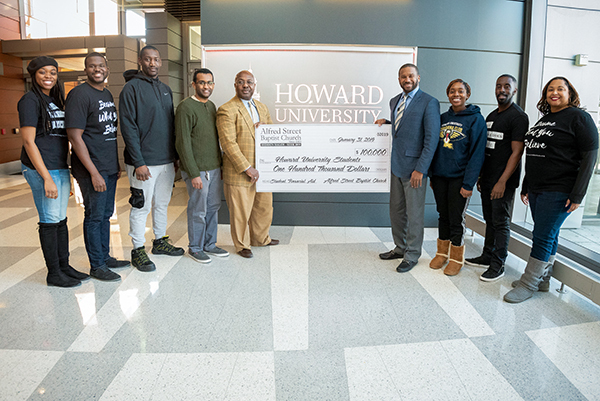 Dr. Howard-John Wesley, pastor of Alfred Street Baptist Church (ASBC); home to one of the oldest African American congregations in the nation, presented Howard University with a $100,000 gift to cover the outstanding tuition and fee balances of graduating seniors. Wesley announced the contribution during a special service at Andrew Rankin Memorial Chapel. Ministers and staff of ASBC joined the Office of Financial Aid to surprise and present unexpecting seniors with the good news earlier in the week. Pastor Wesley and Alfred Street Baptist Church challenge other churches to do the same; and support our HBCUs financially when and where you can. About Alfred Street Baptist Church: Established in 1803, Alfred Street Baptist Church (ASBC) will celebrate its 216th Anniversary in November and is home to one of the oldest African American congregations in the nation. It has served as a prominent religious, educational, and cultural organization in the Northern Virginia community for over 200 years. Currently under the esteemed leadership of Rev. Dr. Howard-John Wesley, ASBC has grown from 2,500 members to over 8,000 members with services on Saturday at 6 p.m. and Sunday at 7:30am, 9:30am and 11:30am. ASBC is also home to the popular Come As You Are (CAYA) worship service. For more information on Alfred Street Baptist Church visit www.AlfredStreet.org.